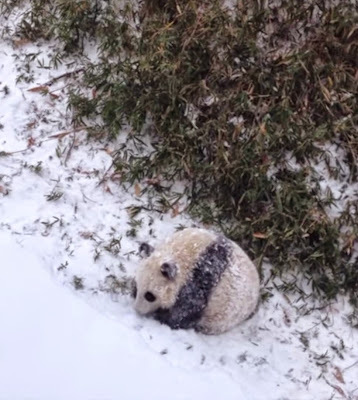 On Tuesday of last week, as the Washington, D.C., area was blanketed with snow, the Smithsonian National Zoo's 16-month-old giant panda cub Bao Bao was romping in it for the very first time. In addition to climbing trees and playing with her mother, she rolled herself up in a ball and somersaulted down a hill (VIDEO HERE). Because their diet of bamboo is low in nutrition, giant pandas don't move much. Panda-keeper Nicole MacCorkle points out the exception, "This is their kind of weather. Their whole way of life is all about conserving energy—but when they see the snow, they can't help it."